Salmon fishing on the North and South Esk in Scotland. With Professional Salmon Fishing Guides and Speycasting Instuctors. 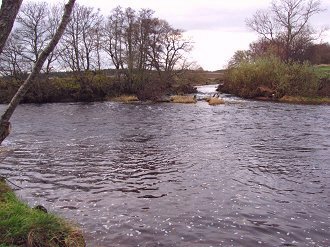 The North Esk is one of the most prolific, Atlantic Salmon fishing rivers in Scotland. 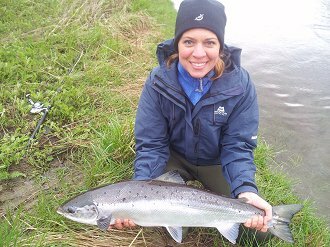 Although it is not as well known as the Tay, Spey, Dee or Tweed, the beats that we fish produce annual catches equal to some of the the very best salmon fishing beats on any of these rivers. The North and South Esk rivers are both considerably smaller than the River Tay which means they are lot easier to fish with a fly fishing rod which greatly increases your chances of covering and catching fish. You should certainly see plenty of fish. 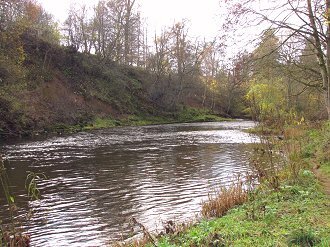 The North Esk holds salmon throughout the year with the spring runs starting from late March and April and the Autumn runs from late August to the end of the season. 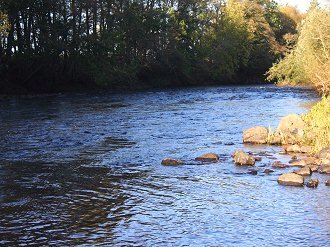 The salmon fishing season on the North Esk and the South Esk starts on the 16th of February and closes on the 31st of October. Our head guide Moray Macfarlane has extensive knowledge of the top beats on both the North Esk and the South Esk as well as being a highly respected Spey Casting instructor. Moray has taught hundreds of clients the art of Spey Casting and salmon fishing and is renowned for his teaching abilities, patience and good humour. Just one of the beats on the The North Esk provides just over 2 miles of salmon fishing with twelve named pools and excellent catch records, this beat is truly one of the best salmon fishing venues in Scotland. All of the pools are easily fished and are perfect for fly fishing although spinning is allowed when the water levels are too high or coloured to fly fish. The river provides excellent sport and salmon can be seen moving at all times of the year. The beat is exceptionally well maintained and there is a fishing lodge situated in the middle of the beat. The lodge has all modern facilities with a fully fitted kitchen, cooker, microwave, washing area and a fridge for cold drinks. There is also a spacious dining area to have lunch and chat about the days fishing. The fishing lodge overlooks one of the main pools where there is ample car parking. All of the pools have easy access for vehicles and there is a good network of footpaths. The South Esk is in turn smaller than the North Esk and produces annual catches on a level par of any quality beat of the River Tay. It is surrounded by beautiful scenery and an abundance of indigenous wildlife including Buzzards, Osprey, Otters, Roe Deer and Red Squirrels. With its crystal clear riffles and deep pools it is truly an enchanting river to fish and a magical place to get away from the stress of everyday life. The South Esk is also renowned for excellent sea trout fishing which we also provide. 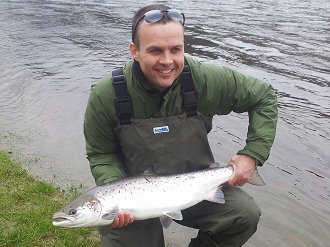 Our head guide Moray Macfarlane is a specialist in sea trout fishing trips having spent many years as the resident guide on the South Esk, one of Scotlands most prolific sea trout fishing rivers. 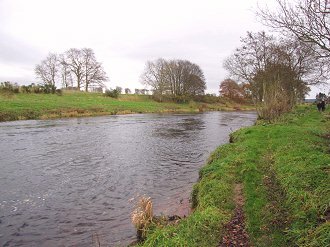 The South Esk is ideally suited to sea trout fishing being only a few miles from the Montrose basin where the sea trout gather in numbers before entering the river system. We can also fish for sea trout on the River Tay but the South Esk has an annual catch rate of at least 4 times that of the very best beats of the Tay. Our sea trout fishing trips start in April with the best months being between June to the end of August. We usually take clients out for a couple of hours of fishing during daylight hours to get to know the riverbank and the pools and we return in the evening to fish through the hours of darkness when the sea trout are most active. Sea trout fishing is very dependant on the conditions and in the event of high water we may revert to day fishing with a spinner or possibly fly. Your permit covers salmon and sea trout and there is always the chance of hooking into a salmon during daylight hours. We will give you the best possible chance of catching some fish and are flexible enough to change tactics to suit the conditions on the day. The main beat that we fish is just over two miles with 24 very different salmon pools, each offering it's unique charm and character. The water is divided into four separate, smaller beats with at least one named, major pool in each beat. There is ample car parking and each beat has it's own fishing hut with tea and coffee making facilities and a microwave. There is a beautiful, newly constructed tree house as the fishing lodge providing some of the best facilities you will find on any Scottish, salmon fishing beat. Our guides are full time professional salmon guides and casting instructors with a very extensive knowledge of the North and South Esk. They will give you all the guidance you will need to get the very best out of your fishing trip. We can't guarantee that you will catch fish but we will gaurantee to put you in the right place with right tackle. You will certainly see fish and we will do our best to help you land some. We can also provide you with all of the fishing tackle required including quality rods, reels, lines, waders, safety vests and a comprehensive selection of hand tied flies to match the river and conditions. If you are fishing for multiple days we can take you to both rivers. For example if you are with us for 3 days we can give you two days on the North Esk and one day on the South Esk or vice versa. We can offer preset three and six day fishing trips including B&B accommodation close to where you will be fishing with transport to the river each day. We would also be happy to provide a bespoke fishing trip. Airport transfers from Edinburgh or Aberdeen airports can also be arranged. My wife arranged through you for me to have 3 days in early September on the North & South Esks with Moray as my guide. I thought you might welcome some feedback. Moray was very organised - arranged a good B&B, picked me up from it, took me to the river and got me into the river quickly. He provided a good, light rod. He made sure the B&B had fixed a packed lunch, and rang the local pub from the river to book me a table. This level of competent organisation continued through the three days. Moray spent the first half day getting me to do a roll cast. He was a patient and clear teacher. As the three days progressed he continued to teach from time to time - including correcting my 30 years of bad habits in overhead casting. I felt a lot more confident about casting at the end. He seemed very expert on the rivers and the fish, and was a mine of information. Both rivers seemed to have lots of salmon - they were jumping so close to me at one point that it was like being in a David Attenborough programme! Strong sun (and probably my poor technique) made the first two days a blank, but Moray's choice of fly and technique won through on the third day with two caught. And the super organisation continued - my wife received photos of the first fish before I had even left the river! Overall, I wouldn't hesitate to book with you and Moray again.